Tamil Nadu 12th Model Question Paper is uploaded and available in PDF format for free download. Directorate of Government Examinations, Tamilnadu conducts 12th standard public exam on Feb-Mar every year. HSC 12th model question paper and previous year question papers help the students to find the repeatedly asked and the important question asked in their 12th public exams. We upload the TN 12th Model question paper on our site. we uploaded previous year question papers in PDF format free download. Download PDF, take printout and read 12th model question paper before you appearing the Public exam. For HSC 12th Standard Samacheer books PDF available for all subjects to download click here to view – Samacheer Kalvi 12th Books. 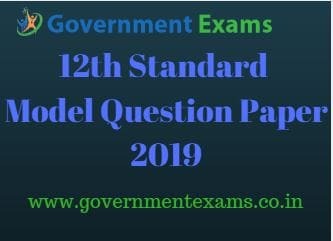 New Model Question papers 2019 PDF will be available for 12th standard all subjects(English and Tamil Medium), Click the link – 12th Question papers 2019. For HSC first year (+1) exam 600 marks and HSC second year exam 600 marks. Totally 1200 marks for two years. To know 12th Public Exam and schedule 2019 Click here – 12th Exam Timetable 2019. New Model Question papers 2019 (English and Tamil Medium), Click the link – 12th Question papers 2019. Result Date for the 12th Public exam 2019 is announced, click the link to view date – 12th Result Date 2019.